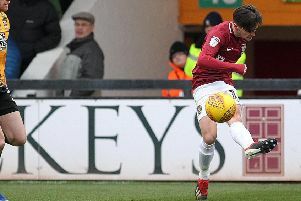 He’s a player that all opposition fans love to hate - but Cobblers boss Keith Curle is a big fan and admirer of Morecambe veteran Kevin Ellison. The attacking midfielder turns 40 next month, but he is still going strong, has again been one of the Shrimps’ key players this season, and is set to start against Town in Saturday’s Sky Bet League Two showdown at the PTS Academy Stadium (ko 2pm). Ellison is currently their joint top scorer with six goals - scoring five in his past 11 games - which takes his career tally up to 154 goals from 604 career starts and 121 substitute appearances. He began his senior career in the Conference with Altrincham back in August, 1999, and has gone on to play for 10 other clubs, but it is at Morecambe where he has really made his mark - on opposition teams as well as their own supporters! He signed for fellow Scouser Jim Bentley in 2011 and has stayed at the club ever since. On the pitch he has racked up 377 starts and 74 substitute appearances for the Shrimps, scoring 85 goals in the process - many of them spectacular ones with his his hammer of a left foot. But aside from those impressive stats, Ellison has also managed to infuriate opposition fans up and down the country with his combative and abrasive nature. He is something of a pantomime villain in league two. As always seems to be the case, he is sure to feel the wrath of the Cobblers fans inside the PTS on Saturday, but Curle feels that deep down inside, all of those supporters will also have a grudging respect for the player. The Cobblers boss is certainly a fan, and believes he is a player who should be looked up to. “Kevin is a player that everybody loves to hate,” said Curle. “Every single supporter will know Kevin, and will readily boo him. “But he has a great passion for the game, and he has an enthsiasm for football. “I think that sometimes that young players could do with having a look at what it takes from Kevin to put in performances, week in, week out. “He deserves to be admired as well because of his understanding of the game. Supporters are reminded that the kick-off for Saturday’s match has been switched to 2pm to avoid a clash with the Saints’ Premiership Rugby Cup clash with Leicester Tigers at Franklin’s Gardens.